“We’ve got to kick up a fuss,” said a woman who had just signed the Tax Justice petition. 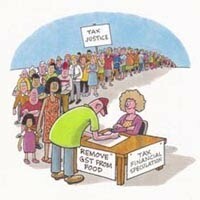 Kicking up a fuss is what the Tax Justice campaign is all about (see petition over the page.) It’s what we’ve got to do right now. But our right to “kick up a fuss” is under threat from the government. National plans to introduce a raft of new laws that will hugely weaken our rights at work. They include extending the 90 day “fi re at will” law to all workers and making it very diffi cult for unions to properly recruit and support members. What the Nats want is for workers to be under the bosses’ thumb. Unions are gearing up to fi ght the law changes. That’s good news. With the Nats also feeling the heat for their GST hike and tax cuts for the rich, we have an opportunity to come at them from both sides. Combine the campaign for Tax Justice with mass action to defend workers’ rights and you’ve got the ingredients for a popular fightback. That’s kickin’ up a fuss alright! 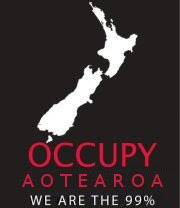 To support the Tax Justice campaign contact Vaughan Gunson, svpl(at)xtra.co.nz or 021-0415 082. Get your workmates to sign the petition. 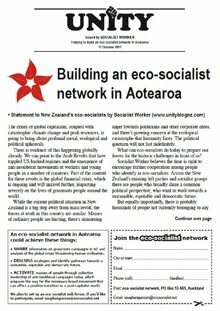 Since the 1980s attacks on workers’ rights have gone hand-in-hand with privatisation, fi nancial deregulation, tax cuts for the rich and GST. These neoliberal policies have made the rich richer and screwed us. With more money to play with and fewer rules and restrictions, the rich gambled on casino capitalism. Speculation has pushed up the price of housing, fuel and food, while destablising the world economy. It’s madness. We desperately need a change of direction. And that’s what the Council of Trade Union’s ‘Alternative Economic Strategy’ offers. 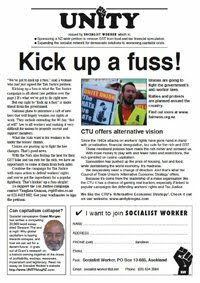 Because it’s come from the leadership of a mass organisation like the CTU it has a chance of gaining real traction, especially if linked to popular campaigns like defending workers’ rights and Tax Justice.